To the regulated, regular man a room, a wilderness and the world are precise, well-defined spaces. To the nomadic, labyrinthine man, condemned to wander on a journey which is inevitably a little longer than his life, the same space will be truly infinite even when he knows  and the more so when he knows  that it is not. Maurice Blanchot, ‘Literary Infinity: The Aleph’, The Sirens' Song, Brighton: Harvester, 1982. We journey, we journey - we arrive at the water, we cross the water, we cross the water in journeying - in journeying! - we go by the grassland, we cross the grassland - in forest we journey, once more descend the hill journeying - journeying, journeying we climb the hill, we cross the hill - on the crest we journey, we go down another hill, still walking on! The second quotation is from a song of the Nambicuara Indians from Western Brazil documented by Claude Levi-Strauss in 'La vie familiale et sociale de Indiens Nambikwara', Journal de la Societe des Americanistes, (37, 1948). 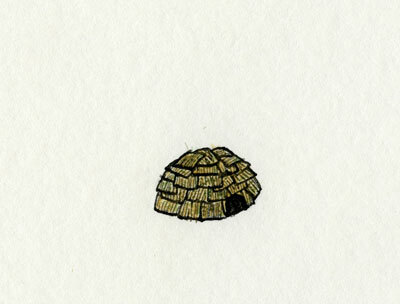 I found the reference in a book in my local library (Enrico Guidoni, Primitive Architecture, London: Faber & Faber, 1975) while I was looking for images of temporary or portable homes, on which some of these drawings were based. By coincidence, around the same time I came across Maurice Blanchot's essay on Jorge Luis Borges which explores the relationship between literature and infinity.